People kayak for many different reasons. Some of us do it because we enjoy the solitude of a crystal clear lake surrounded by magestic mountains. Others do it for the adrenaline rush that can be found in complex ocean rock gardens and surf. Time in a kayak can be an escape from the “land world,” a Sunday ritual with friends, a time to work out problems or contemplate the meaning of life. But for most of us, it’s all of these things. Kayaking is a lifestyle. It’s a spiritual, wonderful thing, and Sean Smith’s book, The Fat Paddler, is proof of this. The Fat Paddler by Sean Smith. I picked up Sean’s book last Wednesday, and immediately found myself sucked in. For Sean, kayaking has provided meaning, purpose, solitude, spirituality, healing and appreciation of the world. Our stories are all unique, and Sean’s is no exception… although what makes him different is that he’s not afraid to share his story, often in graphic detail. This book is Sean’s story about his life as a rugby player and a dramatic series of events that changed everything. His story recounts the Bali bombing and two car accidents, which left Sean nearly dead and in the hospital. These and other events eventually led him to a state of depression. Sean also writes about the challenges of daily life, which can often be quite dramatic… the dread of going to a stressful job, the fight against obesity and quitting smoking, as well as the joys that life brings, such as marriage and having children. Sean’s story takes the reader around Sydney, Australia (where Sean lives) and the wilderness of Alaska. It also travels through the journey of training and competing in the Hawkesbury Canoe Classic. Of course, the book comes complete with some of Sean’s favorite food and rum drink recipes. 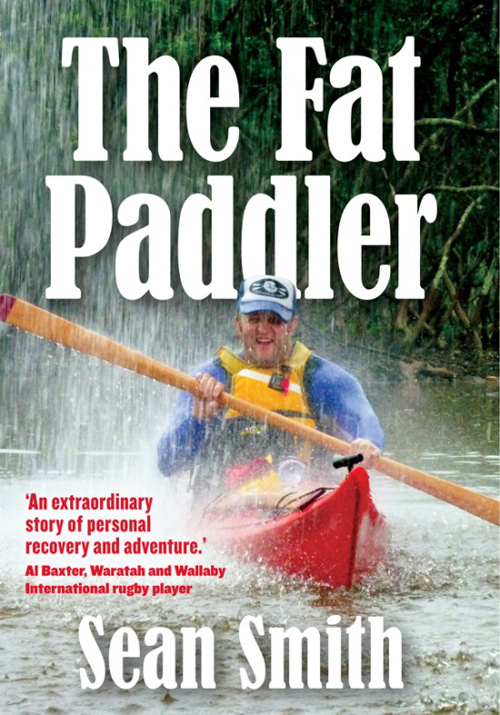 The Fat Paddler is well written, and a book that all of us (kayakers or not) can relate to on some level. All of us face challenges at some time or another… that’s called life. It’s learning how to take these challenges and grow from them that makes us strong, and The Fat Paddler is one person’s example of how healing and happiness can be found in being outdoors. The Fat Padder is available internationally on iBookstore. For the U.S. store, click here. For other countries, search your local iBookstore. Description: Come paddle a range of the newest stand up paddleboards, kayaks and canoes from leading paddlesports manufacturers. Try out the latest gear, take a class (we’ll be teaching rolling), meet other Bay Area paddlers and have your questions answered by the pros. Bring the whole family and stay for the day. There’s something for everyone! Question: I’m using a Tahe Greenland for rolling and daytrips along the Baltic and North seas. For rolling I use a Brooks tuiliq. I think that I can wear it also above my drysuit. But for the daytrips I have when there are just small waves, I get a lot of water in the cockpit. So I’m looking for a new sprayskirt, and I hope that you can recommend one for the Greenland with the LC cockpit. Answer: The Brooks tuiliq is wonderful for rolling, and we wear ours over our drysuits all the time. For paddling however, sprayskirts are often more comfortable. We use the ones made by Snapdragon, and prefer the all neoprene ones. You’ll need to get the cockpit size xxs, and the tube size will depend on your size. Description: Surf Zone 101 is an introduction to surf zone dynamics, swimming in surf, bracing, launching, landing, group management, communication, safety and basic surfing techniques. You will learn how to use foundation skills and others in the dynamic environment of the surf zone. 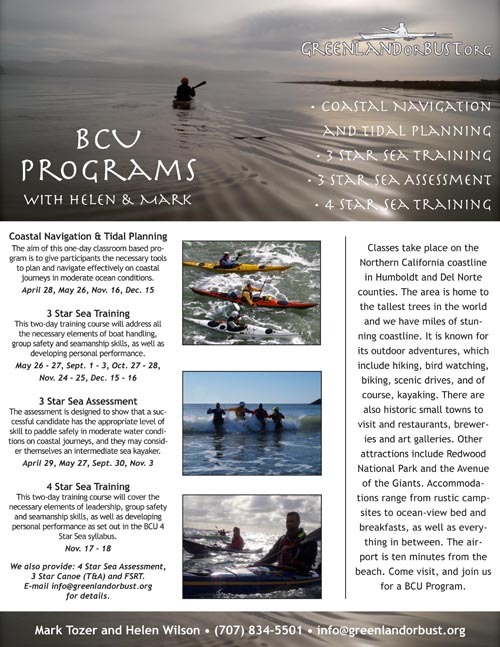 If you paddle in a coastal environment or just like to have fun in your kayak, this class is for you.